IB HQ isn’t your usual cocktail bar. In fact, it doesn’t really look like one at all. But it is home to some of the more interesting cocktails you’ll try this season. Located in the upper storey of a shophouse at the quieter end of Kampong Glam is IB HQ, a cocktail bar unlike any other. For one it looks and feels more like stepping into someone’s prettily decked-out abode; it’s a homely feel exuded in part by the hospitality of the folks manning the bar, and partly because of its non-threatening nature – you don’t feel a pressing need to be well-dressed to fit in just to get a tasty tipple here. 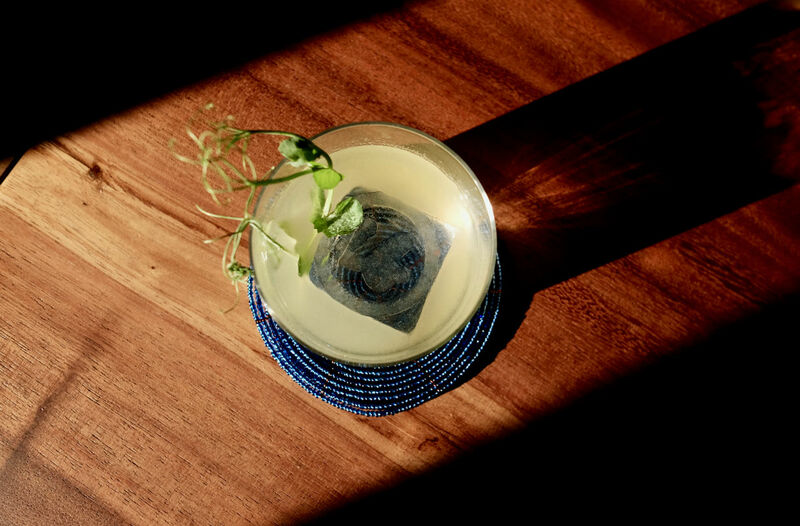 Started by the folks behind The Indigenous Bartender – Kamil Foltan, previously group beverage manager for the Potato Head Group and head bartender from Tippling Club, and creative Zurina Bryant – IB HQ is really a physical manifestation of their ideas around cocktails and a culmination of their various cocktail pop-ups across town in the past year. Important as it is, the bar here is really secondary – much of the magic happens on the attic floor upstairs where the prep work is done. Upstairs you’ll find the kind of equipment a crazy mixologist would aspire to, ranging from an industrial rotary evaporator, sous vide machines, and the like. Anything really, to extract, infuse, and otherwise create flavours that go into your cocktails. That may be the reason why the Osmanthus Gimlet ($22++) here could possibly be the best gimlet we’ve ever tasted, infused as it was with a touch of floral fruitiness only osmanthus can give, or why the Musa ($22++) can blend together flavours of chocolate, banana, and maple in one and yet still taste like an Old Fashioned. And while the Pear ($22++) – a whisky sour with a touch of pear – and the cocoa-accented Negroni that is the Giacomo ($22++) comes a bit closer to the classics they’re inspired by, we’ll leave you to ask the bartenders how the idea for the shockingly delicious Pi Pa ($22++), which uses vodka that’s been infused with parsnip along with pineapple caramel, came about.